Free Kids Fun Run begins at 8:10 a.m.
Day of Race Registration is $30 and begins at 7:30 a.m. If you would prefer to register by mail, please print the form at the bottom of this page. Delaware Running Company and LinMark Sports presents the first annual Delaware 10K Challenge. Runners must run the Wilmington Flower Market 5K and Smith McMillan 5K. Times for both races will be combined and the lowest combined times for Overall male/female and first place in the 10-year age groups will receive prizes. Awards will be presented at the Wilmington Friends School - Smith McMillan 5K. Series Entry Fee: (in addition to race entry) is $10 - all participants will receive a special Long Sleeve Heavyweight T-shirt contact. To register for the series, click here. 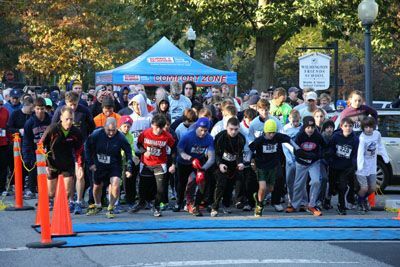 Sponsors will be listed on the long sleeve race t-shirts, posters, on the WFS website and in the Quaker Matters alumni magazine. Click here for more sponsorship information or contact Laura Kurz at 302.576.2980 or lkurz@wilmingtonfriends.org. • Great race for your first 5K! • Chip Timing! USATF Sanctioned Event! • Free Fun Run at 8:10 a.m. Please use this form to register the day of the race or by mail.